I hope they’ve at least kept the bunny hop in this revamped Kick Start. A Flandry book without a gratuitously sexist cover. Surely this is cause for celebration. I’ll go ahead and name one of these nameless horrors. Foes who are horrible shots with weapons. @THX: thanks a bunch. I’ve got that tune stuck in my head now. 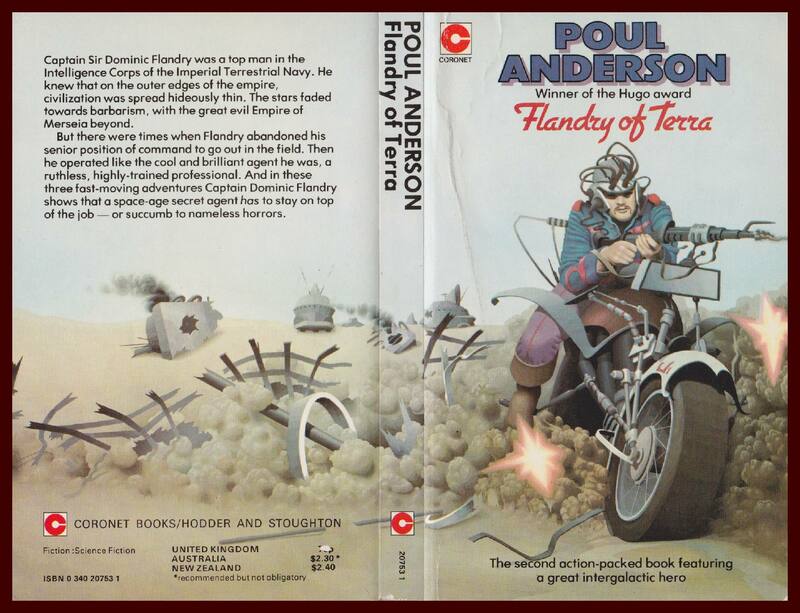 Lacking any apparent steering apparatus, Flandry’s manly motorcycle was of little help navigating through a minefield. @BC Obviously it is a mind controlled motorcycle. Unfortunately, Flandry thinks with his d**k so he ended up at the nearest Hooters. Is that meant to be smoke? Or is he driving through a field of lumpy oatmeal, or possibly overcooked cauliflower? Neither oatmeal nor cauliflower. See that explosion in front of Flandry’s adaptive right boot? It’s popcorn, obviously, and Flandry’s foe is using a heat ray to pop it. Oh, and why does Flandry’s ride have car tires/tyres on it? Since when did he ride a handlebar-less motorcycle through fields of… popcorn? Wearing a stupid helmet? At least there isn’t any cleavage. Yay. He’s up there with Adolf, living The Iron Dream. Is it me, or is he sitting backwards on that motorcycle? Also, those are clearly fake tings! Did they get George R. R. Martin to model for the titular character? @Tracy: Nah, GRRM has always had more facial hair. Little known fact, this was the box art for Nameless Horrors Popcorn back in the 70s. It wasn’t nearly as successful as Screaming Yellow Zonkers.